HALT aims to remind tradies they are valued by their community, and direct them to support services, both local and national, should they need them. HALT (Hope Assistance Local Tradies) works in conjunction with communities to host ‘SAVE YOUR BACON’ brekkies. In 2013 on a not-so-sunny day, a sad and tragic event affected the lives of two Castlemaine locals. A family lost a loved one, the community lost a valued member and we lost a friend. The ripple effect was huge. A house painter and a visual artist asked themselves, “What can we do to support our mates, our families and our partners in the trade industry who just aren’t coping?” From that conversation began a community movement to support our men and women in the trades. An event to remind tradies they are valued by the community, and helping them to link into support services, for themselves and for their mates. 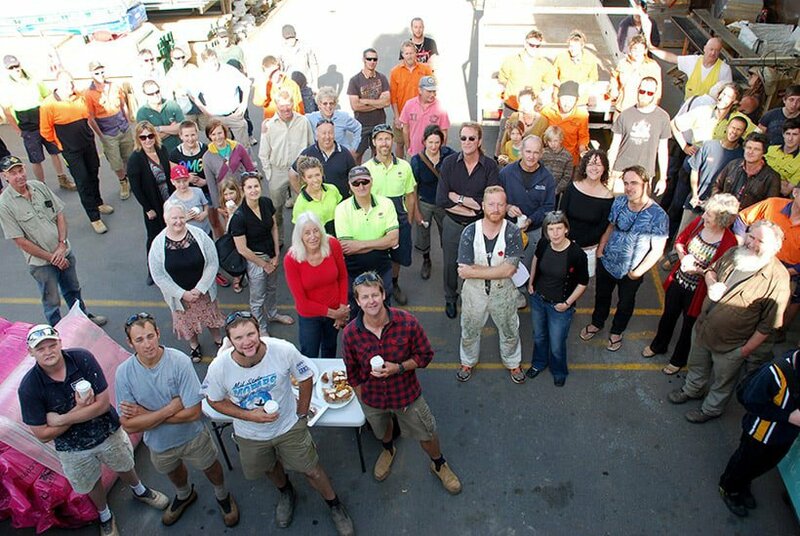 HALT was born with the support of a concerned community, and went on to host the first ‘SAVE YOUR BACON’ Brekky in Castlemaine, November 2013, for those in the building industry. It all started early one morning in a timber yard of a local hardware store. Rotarians busy behind the BBQ cooking a breakfast of bacon and eggs, hot coffee brewing – all thanks to the generosity of local companies and individuals. There was also fruit and pastries, and a free goodie bag for each tradie with freebies such as packets of coffee, sunscreen, chocolates and, if you were lucky, a voucher for a dinner or a massage. Everything generously donated by local businesses. We know that social connection is always good for our mental health but it is the HALT bags that carry the important message to take home. Each bag contains information on mental health, well-being and suicide prevention. There is information on how to manage stress, depression and anxiety and importantly, where to go when you or a mate needs help. Material comes from local health services, as well as bigger national organisations such as Beyond Blue and Lifeline. HALT are not counsellors, but rather, a connection between our tradies and the services that can help. Our role is to help facilitate the spread of information already available. The ‘SAVE YOUR BACON’ brekkies have travelled across Victoria, New South Wales, Queensland, South Australia and Western Australia. At last count, HALT had held over 200 ‘Save your Bacon’ events in hardware stores, TAFEs, sporting clubs, secondary colleges, Men’s Sheds, the farming and mining communities, corporations and private businesses. HALT was the recipient of a 2017 WorkSafe award for OHS Achievement of the Year. In early 2018, HALT was featured in the documentary ‘Tough Conversations with Henry Rollins’.